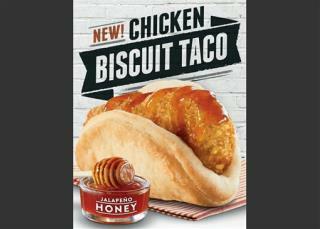 (Newser) – The newest weapon in the breakfast wars is a biscuit shaped like a taco. Taco Bell is launching a "biscuit taco" this week and ditching its "waffle taco," which got widespread attention last year when it was included in the rollout of the chain's breakfast menu. The swap comes as the chain tries to build on its year-old breakfast business by once again going after the dominant player in the mornings, McDonald's. And how: In a new ad campaign, Taco Bell plans to paint Egg McMuffins as boring, routine food for the brainwashed. In New York and Los Angeles, it's putting up propaganda-like posters for a place called "Routine Republic," with one featuring a demonic clown holding what looks like an Egg McMuffin with the words "Routine Rules." What a BAD way to waste a BISCUIT!! There ya go ALL!! The only thing I like about fast good is the sheeple who scarf it down die off quicker and that's good for everybody.